I’ve written recently about my sudden lack of fear to try new and death-defying activities like indoor skydiving, zip lining, and white-water rafting, but until recently I had been far too afraid to try something as scary as a spa treatment. 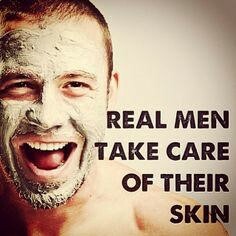 Then my wife gave me a gift certificate to get a “men’s facial.” My idea of facial skin care involves shaving every day and occasionally putting on sunscreen. The thought of filling my drawer with creams and astringents and actually learning what is good for my skin seemed like a massive waste of time and money. However, I had started to notice that my “laugh lines” were starting to look like fault lines, small crevasses etched around my eyes and across my forehead. The parenthesis around my lips was starting to look like misplaced dimples growing deeper every day and being joined with other weird creases that I had never noticed before. I figured that if I could crash through a Class V rapid, I could survive a facial with my dignity intact. So, I made the appointment. I’m ushered into a lounge where I can sip on tea or flavored water, and I am told that Krissy will be with me shortly. I feel mildly aroused at the thought, but I’m pretty sure it’s just the rush that I’m getting from the flavored water. Minutes later, I’m greeted by a pleasant young woman who takes me back to a dimly lit room featuring something like a massage table. She instructs me to take off my t-shirt and shoes and make myself comfortable on the bed. Maybe it’s just me, or maybe its volume of the steamer but I find breathing the steamy air through my nose to be distinctly uncomfortable. I feel a little like I’m being waterboarded except that I’m paying for it, and I feel like I can’t complain because I have absolutely no idea how it’s supposed to feel. As I grow used to the hissing robot arm, Krissy goes to work. I discover quickly that there is no chatting during a facial. As she starts spreading the first layer of oil or cream across my forehead, down my cheeks and everywhere that is not my eyes and mouth, I realize that I need to keep my mouth shut or risk swallowing whatever product she is using. Relieved of the need of any conversation, I begin to relax as she slathers layer after layer of creamy, oily goo over my face. She removes each one gently with warm towels before she applies the next layer, but they all seem exactly the same to me except for some are more slightly aromatic. I’m starting to think that they are all the same (after all, my eyes are closed) when she slips in a lotion that is tinged with Ajax or some other abrasive. I think that maybe I’m being exfoliated although I don’t exactly know what that means. I think of it as the light sanding that I do before I put on the finishing coats of paint on a wood project at home. Sure enough, one or two layers later, I’m done. She lets the warm towel rest on my face for a bit before giving me a final wipe-down and informing me that “our time is up” and that she’ll meet me in the hallway when I’m ready. She is impersonally friendly as she asks if I enjoyed the experience, and I’m reservedly enthusiastic while I thank her and retire to the rest room to actually stare at my face and see if all that attention has made any difference. To my surprise, it has. It is as if she has Spackled over the worst of the cracks and crevices, and even once I remove the residual oiliness, I can feel how much smoother my skin is to the touch. I do not look any more youthful–I’m pretty sure no amount of lotion is going to achieve that–but it is as if I have gotten a very inexpensive face lift or a Botox treatment without the nasty needles. I start to think that this was actually a darn good investment as I walk back through the coma-inducing lounge and into the reception area. I’m greeted once again by my new best friends who assure me that, of course they can book me with Krissy for another facial some time soon. After all, let’s face it. The women that I know look better, smell better, and are smarter than I am. I’m all in on the facials. Bring on the mani-pedis. I’m ready. I’m deeply concerned for your welfare. I think you should drop everything you are doing, build something manly out of steel, then swear at it profusely when it fails and maybe slay a fearsome insect with your bare hands. P, I totally understand your concern. I feel a need to go and buy a chainsaw that is too big for me and cut down a large tree.